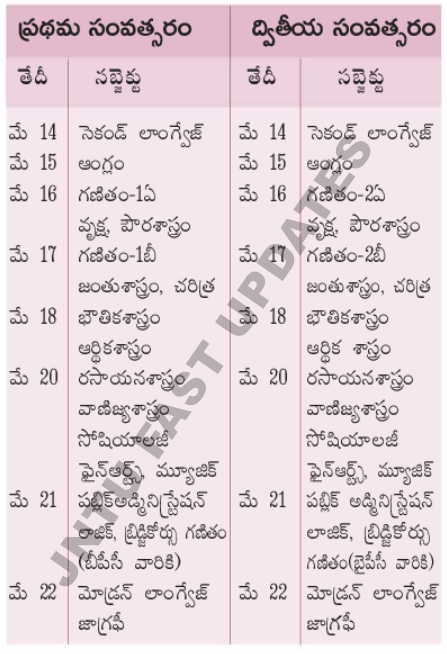 AP Inter 1st, 2nd Year Supply Time Table 2019: Andhra Pradesh Intermediate First and Second Year Advanced supplementary Time Table May 2019 released. Students can check Manabadi AP Inter 1st year supply time table, Ap Inter 2nd Year Supply Time Table from links given below. Board of Intermediate Andhra Pradesh has released the Intermediate 1st Year and 2nd Year results on 12th April. The AP Inter board has expressed that compared to the previous years, the student rate and pass percentage were simultaneously changed this year. While this year 2019, the general pass percentage for 1st year is 60% and 2nd Year is 72%. The BIEAP is going to organize the Advanced supplementary examinations in the month of May. Students who are waiting to check the details of AP Inter 1st year and 2nd year supplementary exam details from check more information from this article. Students who have already check the AP Inter 1st year and 2nd Year results can check the advanced supplementary examinations details from this article. The BIEAP has scheduled to conduct the advanced supplementary examinations from 14th May to 22nd May. The BIEAP has unveiled this temporary time table to conduct the AP Supply examinations 2019. As per the scheduled time table, the AP 1st year advanced supply examinations will be held from 14th May to 22nd May from 9 AM to 12 PM and the 2nd year supplementary examinations will be held during the same dates from 2.30 to 5.30 in the afternoon session. The Intermediate Board has said that the Ethics and Human values examination will be held on 7th June from 10 AM to 1 PM and Environmental examination will be organized on 10th June; while the practical examinations will be held from 27th May to 30th May. Students who failed in few subjects, or seeking betterment is the score can apply for the AP Inter advanced supplementary examinations during the announced dates. All the Principals are informed that the Intermediate Public Advanced Supplementary Examinations, May/June 2019 (Theory) will be held from 14-05-2019 to 24-05-2019. A copy of the detailed Time-Table is also available in the BIE Website www.bieap.gov.in. The First Year examination will be held from 9.00 A.M to 12.00 Noon in Fore Noon session and Second Year Examination from 2.30 P.M to 5.30 P.M in After Noon session every day. Therefore, you are requested to give special emphasis on the dates & timings of the examinations. Click on AP Inter advanced supply exam Time tables 2018 link. What are the dates for betterment ? Maths2b:11 no change in regular and supply exams same marks please understand my problem and pass me both subjects otherwise one year will loose hall ticket no:1805213313.please understand my problems my course in inter is mec.